I love a versatile recipe – something you can use as an appetizer, a salad, or a summer entree – and this is one of those recipes. I originally developed this recipe for a Mexican themed cooking dinner party I was leading, but have used it many times since. I call this a mock ceviche because instead of allowing citrus juice to cook the shrimp over several hours (or overnight), I actually precook the shrimp. I like this technique when a large group will be eating the food as I don’t want anyone to be squeamish about the “raw” (even though it’s really cooked by citrus juices) shrimp in a true ceviche. If you make it the authentic way, simply marinate the raw shrimp lime juice overnight and then combine with remaining ingredients. In a large stockpot, bring 1 quart salted water to a boil. Add 2 tablespoons of the lime juice and then add shrimp, cover, and return to a boil. Immediately remove from heat and drain. Return shrimp to hot pot, replace lid and set aside, letting shrimp steam in closed pot for 10 minutes. Spread out shrimp to cool completely. When cool, peel shrimp and toss shrimp with remaining Â½ cup lime juice, cover and refrigerate for about 1 hour. Rinse chopped onion under cold water in a strainer and shake off excess liquid. 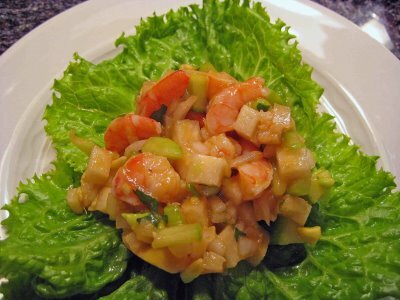 Add to shrimp in a large bowl along with chopped cilantro, ketchup, hot sauce, optional olive oil, cucumber and/or jicama and avocado. Mix gently, taste and season with salt. Cover and refrigerate up to a few hours, or serve immediately. To serve, spoon the a large lettuce leaf. If desired, garnish with sprigs of cilantro and slices of lime. Howdy I am so delighted I found your site, I really found you by error, while I was researching on Bing for something else, Anyways I am here now and would just like to say thanks a lot for a tremendous post and a all round enjoyable blog (I also love the theme/design), I don’t have time to browse it all at the minute but I have bookmarked it and also added in your RSS feeds, so when I have time I will be back to read much more, Please do keep up the fantastic work.